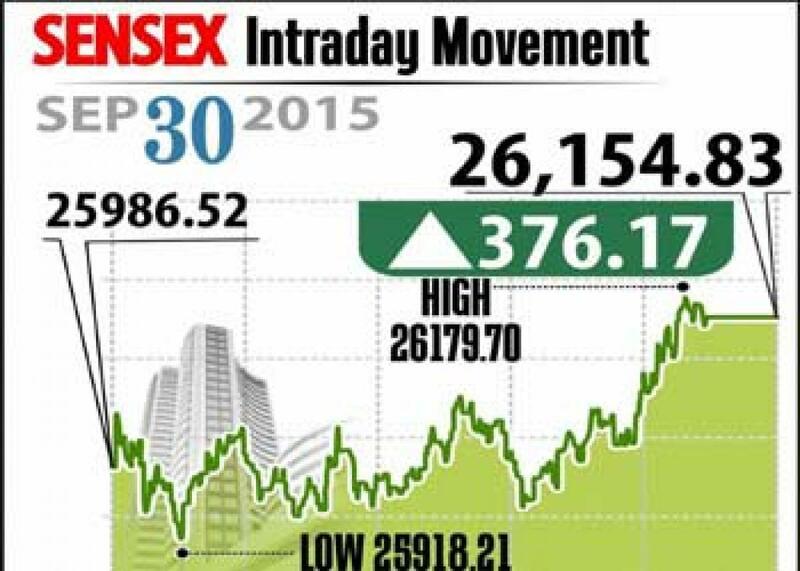 Strong global cues lift markets. Bulls are back in Dalal Street with a bang taking lead from global peers on Wednesday, besides RBI\'s repo rate cut also boosted sentiment. Sensex closed higher by 376 points up over 1 per cent at 26,155 and Nifty gains 105 points at 7,949. Mumbai: Bulls are back in Dalal Street with a bang taking lead from global peers on Wednesday, besides RBI's repo rate cut also boosted sentiment. Sensex closed higher by 376 points up over 1 per cent at 26,155 and Nifty gains 105 points at 7,949. The broader markets also gained on par with the index shares with midcap index closed with 1.7 per cent gain and smallcap index ended up by 1 per cent. According to analysts, the market would be range bound with positive bias and Nifty may even reach the levels of 8,150. Also, the global markets seen going strong, they added. On the sectoral front, all the sectors registered gains excepting bank shares, while metal index gained over 2 per cent. The bank stocks were seen profit booking with Axis Bank down by 1.4 per cent. SBI also lost about 2 per cent. From Metals space, as the steel producers contemplating to increase prices, the metal stocks bounced back with Tata Steel and JSW Steel zoomed over 5 per cent followed by Hindalco, Coal India, Jindal Steel gained over 3 per cent each. Engineering major L&T gained over 1 per cent as it has emerged as finalist for the contract to supply artillery guns. While auto major Hero MotoCorp zoomed over 2 percent as it expanding its presence in 2-wheel market. The gainers: Tata Steel, up 5.24 per cent at Rs 211.90; Bharti Airtel, up 4.50 per cent at Rs 338; BHEL, up 4.18 per cent at Rs 205.55; Gail India, up 3.90 per cent at Rs 302.10; and Coal India, up 3.78 per cent at Rs 326.50. The losers: SBI, down 1.96 per cent at Rs 237.25; Axis Bank, down 1.68 per cent at Rs 495.55; Vedanta, down 1.33 per cent at Rs 85.10; TCS, down 0.10 per cent at Rs 2,587.70; and Maruti Suzuki, down 0.08 per cent at Rs 4,671.05.